SPRINGFIELD, OH--(Marketwired - June 01, 2016) - Global lifting leader Konecranes (HEX: KCR1V) launched its new North American online parts depot this week, under the well-established Crane Pro Parts banner. Crane Pro Parts, the parts supply organization of Konecranes in the U.S., is known for providing spare parts for "any crane, any time." And, this new enterprise pushes that promise even further, giving registered customers 24/7 access to the parts and information that they need. According to Scott Gilbey, Senior Vice President of Customer Experience and Service Offering, the STORE merges two Konecranes core initiatives: exploring the potential of the Industrial Internet and delivering Lifecycle Care in Real Time. "Our goal is to serve our customers efficiently and quickly, to give them a better experience and provide transparency on pricing and information about their cranes," says Gilbey. "We already have a parts e-portal where customers can go online, search for parts, and make a purchase. What the new STORE does is take that to the next level. It is much more user-friendly and data-rich, and it integrates with our enterprise systems for faster service." Crane Pro Parts has been offering its existing e-portal customers a preview of the new site, and the reviews so far have been overwhelmingly positive. Some of the most desirable features include the ability to search by part ID or name, clearly stated pricing and a view of inventory. If an item is out of stock, the STORE predicts when it will be available. Customers also appreciate that they can access the STORE and get a price immediately, which can potentially save a day or more compared to typical quotes delivered through email. Another popular option offered by the STORE is the ability for customers to access archived orders and saved parts lists, offering a shortcut to critical part numbers and repeat orders. In the event that an employee of a registered company leaves, his or her successor will be able to see what their predecessor ordered previously. If there are two active employees at one company, both can view the order history. 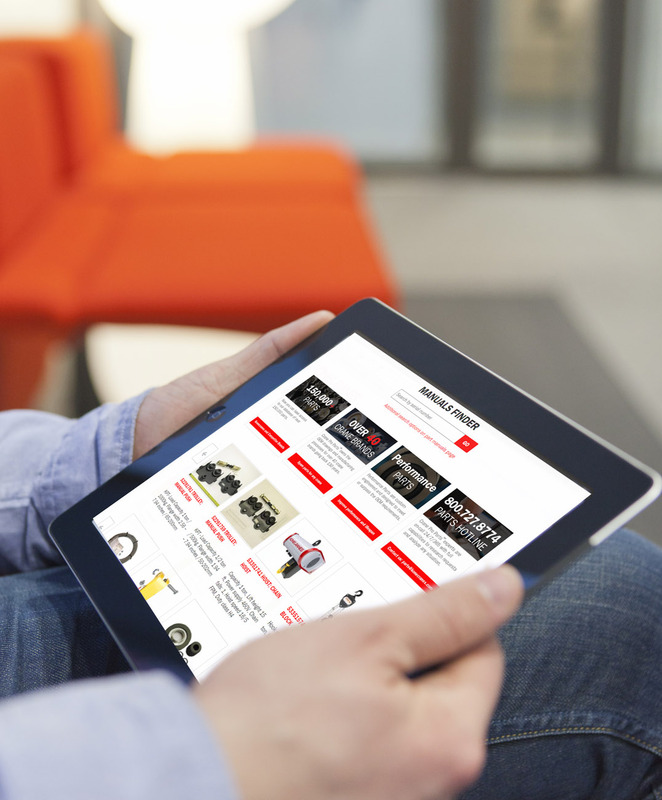 The STORE also allows customers to access an online library of scarce or out-of-print parts manuals for the 40-plus brands in the Konecranes family of OEM brands. Furthermore, customers who have access to the Konecranes customer portal, yourKONECRANES.com, can benefit from the STORE. The data in yourKONECRANES can help customers make maintenance decisions including parts replacement. At the same time, access to the STORE can speed up maintenance actions. If more proof is necessary to convince crane parts buyers that Crane Pro Parts STORE by Konecranes really is an evolutionary experience, it can be found close to home. Konecranes Service branches are using their STORE for internal processes to order parts and better serve customers. "The STORE is more than a marketing tool," says Gilbey. "It's about speed and transparency, a way of doing business using the industrial internet." The STORE is readily accessible on a mobile device, allowing an inspector or technician to search for prices and order needed parts while on location at a customer site. Customer companies with their own maintenance staff have the option to order parts directly with the STORE or purchase through a local Konecranes service branch, whichever they prefer. Also introduced in the European Nordic region, Konecranes STORE will soon be available worldwide. The next markets to launch the STORE are projected to be Germany and Australia. China, the home of successful e-commerce giants, is also on the radar. "This initiative is integral with our effort to provide Lifecycle Care in Real Time," says Gilbey. "Transparency, speed and efficiency are the key concepts behind the STORE. We want to give our customers an option for obtaining parts in a way that is most convenient for them." Crane Pro Parts and Konecranes U.S. customers can register for access to the Crane Pro Parts STORE by visiting craneproparts.com or konecranesusa.com, clicking "STORE" and requesting access. In 2015, group sales totaled EUR 2,026 million. The group has 11,900 employees at 600 locations in 48 countries. Konecranes is listed on the NASDAQ OMX Helsinki (HEX: KCR1V). This press release is available at konecranesUSA.com. About this company Konecranes, Inc.